Wael is one of the fisherman’s villages located in West Seram, Maluku. It can be seen from the coastal area and also the boats owned by the villagers that are used for activities in the sea. Besides as fishermen, the villagers also work as a farmer so that there is an area management according to the season. The different space utilization are caused by Wael village which has a very potential sea and land to the livelihood of the villagers, and also for the surroundings. This study aimed to explain the space management utilization of sea and land in Wael village. This research used an inductive-qualitative method and analyzed descriptively. The analytical unit was in the form of the space, activities and people in Wael village. This study discusses each land potential in coconut plantations, cassava gardens, clove plantations, and eucalyptus oil leaves, and also the sea potential such as seaweeds, mangrove crabs and keramba. The villagersutilizesthe space management according to the season. Because of dangerous, bad weather, waves and strong winds, people utilizes the potential of land in a rainy season. On the other hand, they utilizes the potential of the sea in a dry season. Fishermen in other areas of Indonesia distresses when the weather was bad, but it does not work for Wael’s villagers. BOTANRI, Adnan Affan Akbar; WAHYUHANA, Ratika Tulus. MANAJEMEN RUANG NELAYAN DI DUSUN WAEL KABUPATEN SERAM BAGIAN BARAT PROVINSI MALUKU. Jurnal Planologi Unpas, [S.l. ], v. 5, n. 1, p. 875-884, mar. 2018. ISSN 2581-0081. 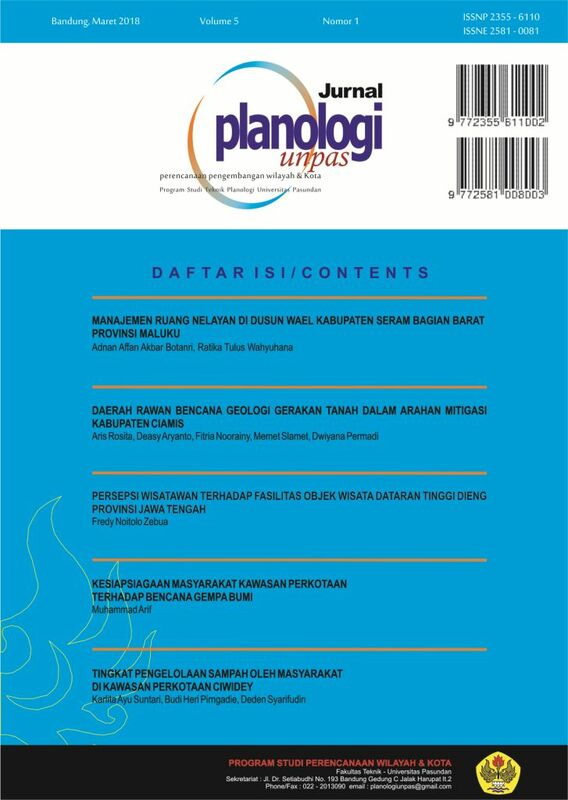 Available at: <http://journal.unpas.ac.id/index.php/planologi/article/view/924>. Date accessed: 25 apr. 2019. doi: http://dx.doi.org/10.23969/planologi.v5i1.924.